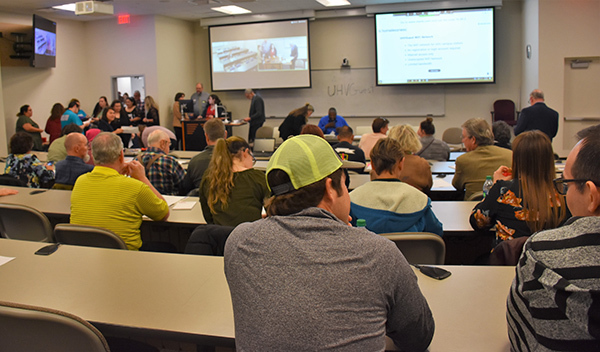 University of Houston-Victoria faculty, staff and community members prepare to take their seats Thursday for the start of the first part of the UHV School of Education, Health Professions & Human Development’s Homelessness Symposium. Presentations were given by Lisa Griffin, president of the Victoria Area Homeless Coalition; Yvonne Rossman, family and KIDZ Connection coordinator for the Victoria Independent School District; and Tim Stahlke, senior coordinator for the Texas Homeless Education Office. Following the three main speakers was a panel discussion moderated by Paul Carlson, UHV professor of education and one of the symposium coordinators, and Tammy Nobles, VISD director of student services. Part 2 of the symposium will focus on how to have a positive impact on homelessness in the area. The session will take place from 5:30 to 7:30 p.m. March 7 in UHV University North, 3007 N. Ben Wilson St.